Automobile companies continue to accelerate their brand equity when it comes to global brand power. The latest 2018 Interbrand Study sees 16 vehicle manufacturers – 15 carmakers and 1 motorcycle manufacturer – confirm their presence on the global firmament. Japanese OEM Subaru drives in for the first time, replacing EV major Tesla in this year's who’s who brand list. As the automotive world currently witnesses one of its biggest disruptions in decades, on the backdrop of the diesel debate, depleting fossil fuel resources and the sharpened focus on electro-mobility as the silver bullet to reduce pollution levels on wheels, automobile manufacturers continue to hold sway when it comes to pure brand strength. Technology, though, continues to steer ahead of the automotive sector, thanks to the surging demand for new-age tools in terms of connectivity, artificial intelligence, Internet of Things and digital experience. Meanwhile, automakers, purely on the power and panache of their products and aspirational connect with consumers, retain their strong showing on the branding front. "A decade after the global financial crisis, the brands that are growing fastest today are those that intuitively understand their customers and make brave, iconic moves that delight and deliver in new ways. When looking at our Best Global Brands data over the last 10 years, it’s clear that ‘Role of Brand’ is more important and valuable than ever, and has continued to help leading organisations accelerate growth, even at a time when an overall sense of trust in institutions has been in steep decline," said Charles Trevail, global CEO, Interbrand. Branding has shifted from being about ensuring consistency to stimulating desire; from marketing-centric to enterprise-centric; from simply creating functional and emotional differentiation to fundamentally changing the way a business goes to market; and from communicating the consumer experience to actually shaping it. So, what can one learn from how the world’s leading brands are achieving success in this environment? What sets apart the good from the great? According to Interbrand, 'Activating Brave' means harnessing the ability to take bold, short-term action that responds to the needs of the marketplace while pursuing a clear and aligned long-term vision. To simultaneously look through a microscope and a telescope, to have the courage to intercept the future, not just flow with it, and, To take decisive action that makes a real impact. Only when you have the sanctuary of a deep understanding of who you are, and where you are going tomorrow, can you confidently make the brave short-term calls needed to Activating Brave win today. In the 2018 list of the Top 100 global brands, 33 brands across segments have some or the other presence in the automotive space. In fact among the top five companies, four – Apple, Google, Amazon and Microsoft – are working to define the future of mobility. 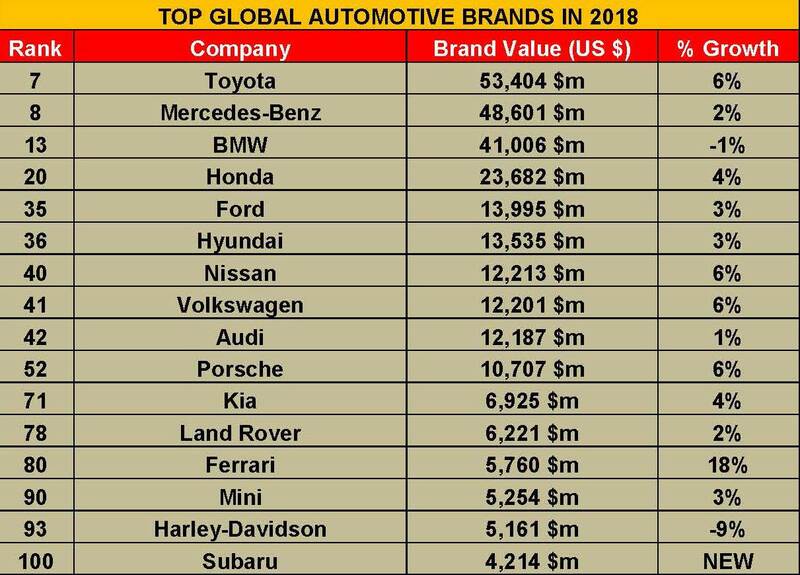 Interestingly among the global automotive brands Japanese carmaker Toyota continues to be the top brand, followed by Daimler and BMW. The study finds that technology company Amazon has seen its average brand value grow by 36 percent every year over the last five years, in part by continuing to diversify its offerings, with relevance driving the increase. Online payment firm PayPal has seen its brand value increase by 56 percent over the past three years by focusing on acquisitions to drive greater presence. The study says that leading brands are driven by their desire to be useful, to create products, tools and services that actually solve customer problems, and to use their marketing to serve and not just sell. Although the journey may be different for every brand, there are some overarching key themes that was seen emerging, which enable brands to activate the bravery required to achieve success in the long-term – positive utility, subscription mindset, customer-centricity, learning from luxury and the role of brand. "Apple, ranked No. 1 on Interbrand’s Best Global Brands again in 2018, continues to set the standard for what it means to be a world-class brand in the 21st century by responding to today’s ever-changing customer expectations," added Trevail. In a noteworthy mention, American electric vehicle maker, Tesla which ranked No. 98 in the Interbrand 2017 Global Brands study, has dropped out of the list. On the other hand, the world's 22nd largest carmaker from Japan, Subaru debuts in the list at the 100th place. This year marks the 19th time that the annual ‘Best Global Brands’ study has been published by Interbrand. The study is considered by leading CEOs worldwide to represent the competitive benchmark for the value of international brands. The study is designed to identify the world's 100 most valuable brands. Interbrand's brand valuation considers the three aspects: ‘Financial performance of the brand's products or services’, ‘Role of the brand in the purchase decision-making process’ and ‘Strength of the brand in relation to safeguarding the company's future revenue’. This method is the first one to be successfully certified according to ISO 10668:2010, an international standard that defines the basic requirements on procedures and methods for determining the monetary value of a brand.